Standing room only in Navaluenga! IMPORTANT UPDATE - SCREENING HAS BEEN POSTPONED DUE TO TUBE STRIKE IN LONDON. NEW DATE WILL BE ANNOUNCED SOON. Cannes Film Festival press and distributor screening of Con Buenas Intenciones will be on Saturday, May 16th, 4.30pm at the Eden Hotel - 133 rue d’Antibes 06400 CANNES. 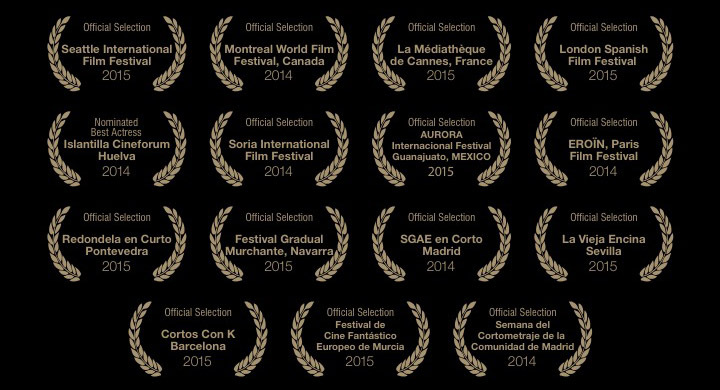 The 2015 official selections have now been announced for ‘La Vieja Encina’ in Sevilla, Spain. Con Buenas Intentions is confirmed as one of 35 selected films screening at San Nicolas del Puerto, Sevilla between 22nd and 25th of January. Further details at www.sannicolasdelpuerto.es. Official Selection has been confirmed for the 3rd ‘Projection d'Héroïnes’ in Paris on Saturday, December 20th at the Elysées Biarritz, 22-24 rue Quentin Bauchart, 75008, PARIS. Director, Virginia Romero and Producer, Tony Allen will attend and present the film. The ‘Projection d'Héroïnes’ is in association with ‘Le Jour le plus Court’ and Centre National du Cinéma et de l'image Animée (CNC). Official Selection has been confirmed for Soria - Certamen Internacional de Cortos 'Ciudad de Soria' XVI Edición. The film will screen at 21:30 on Thursday 27th at Palacio de la Audiencia. CLICK HERE for full details. The producers are attending the Rome Film Festival as part of 'Business Street' from Saturday 18th through to Tuesday 21st October. CLICK HERE for more information. A new trailer with English sub-titles is now available to watch on-line. CLICK HERE TO VIEW. Two new dates have been announced in Madrid as part of SGAE en Corto. Screenings will take place on 29th of September at 21:30pm and 30th of September at 20:00pm at Sala Berlanga, Calle Andres Mellado 53, 28015 Madrid. The producers are very proud to anounce that Kiti Mánver has been nominated for the Best Actress award for her performance in Con Buenas Intenciones at the 7th Islantilla Cinefórum in Huelva, Spain. Official screenings at the 2014 Montreal World Film Festival have been scheduled for August 25 at 19:10 and August 26 at 14:40. Both will take place in screening room L13, Cinema Cineplex Odeon Quartier Latin, 350, rue Emery, Montreal. Con Buenas Intenciones recieved it's first public screenings on Saturday, 24th May at Cine Estudio del Círculo de Bellas Artes in Madrid as part of the 16ª Semana del Cortometraje de la Comunidad de Madrid. The film was introduced by Virginia Romero, Tony Allen and three of the cast - Gorka Otxoa, Roger Pera & Ángela Encinar. Despite clashing with the European Cup Final, the cinema was three quarters full and the film recieved a fantastic audience reaction. Con Buenas Intenciones Director, Virginia Romero was interviewed by Maite Robles on Madrid's Onda Mujer (Wave Radio) this morning (Friday, 23rd May) about the film and the challenges for women directors working in a male-dominated industry. Click here for Video of Glenn Freemantle being presented with his Oscar® for 'GRAVITY' by Charlize Theron & Chris Hemsworth (yes, we were fortunate enough to work with the same sound designer as Alfonso Cuarón). But incredibly, Glenn is not the only Oscar® winner on our team. Our film was also mixed by the amazing Ian Tapp, CAS who won his golden statue in 2009 for Danny Boyle's 'SLUMDOG MILLIONAIRE'. Watch Ian's 'thank you' speech here. Virginia Romero joined directors of some of the other films selected for the 16ª Semana del Cortometraje de la Comunidad de Madrid, for a public discussion of their films today (Monday 19th May). The event was held at Libreria Ocho y Medio in Central Madrid and was attended by the press and filmed for broadcast by TVE. The very first public screenings of Con Buenas Intenciones have now been confirmed for Saturday, 24th May at 17:00 and 20:00 at Cine Estudio del Círculo de Bellas Artes Marqués de Casa Riera, 2. Madrid. See the Cortometraje website for more details. Check out the latest movie stills including images of each of of our fantastic cast in character - click here. Con Buenas Intenciones now has a Facebook page - please take a look. You can follow all the latest news on the film on Twitter. The official pre-release screenings have now been arranged by Communidad de Madrid as part of short film week. We are really pleased to have been selected for the final night (Saturday May 24th) when there will be two screenings - one at 17:00 and the other at 20:00 at Circulo de Bellas Artes in the centre of Madrid. We are pleased to announce that sound post is now completed at Pinewood Studios. We are incredibly lucky to have sound design by Oscar winning (Gravity) Glenn Freemantle and his team at Sound24, as well as a final mix by Ian Tapp (yet another Oscar winner - Slumdog Millionaire). This together with an awesome score and soundtrack from Ram Khatabakhsh and the hauntingly beautiful voice of singer Roxana Rio has transformed the film into something truly special. We can't wait to present the film at it's international premiere in Madrid. Watch this space for announcement of the date. We have just completed a terrific grade of the film with Vince Narzuzzo (Narduzzo Too) at Pinewood Studios. We can now finally see just how gorgeous are the pictures shot by our talented DOP, José Martin Rosete. With online post and DCP production by Nigel Gourley and David Chisolm at OutPost Facilities, we have images to be proud of.